There is a common misconception among people who have never eaten MRE’s that they are the same as backpacking meals. (I’ll even admit to being this naive in the past) They are both lightweight meals on the go; that’s about where the similarities end. Most Mountain House backpacking meals have 400-600 calories. 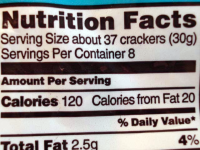 All military MRE’s have approximately 1250. Everyone knows survival is a calorie game. You have to put as much or more in than you use and MRE’s are a more efficient way to do that. 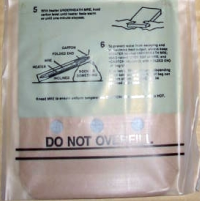 Every standard issue MRE comes with a side dish, usually something like rice, vegetables, or fruit. Backpacking meals only come with one main entree unless you buy extra sides. MRE’s come with a dessert package and candy (yes, both) as well as a spread for your bread like peanut butter, jelly, or cheese. Backpack Meal: No, No, and No. 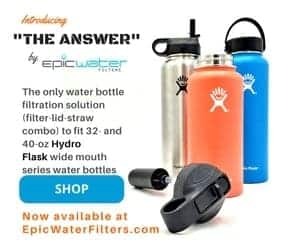 MRE’s get a sports drink, hot chocolate, tea, coffee, or shake. Of course with backpacking meal you have to bring your own. 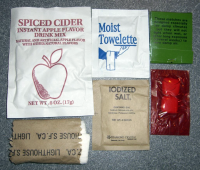 Every MRE comes with an accessories packet that can include things such as (but not limited to) spoon, matches, TP, wipes, sugar, salt, chewing gum, and of course Tabasco. You know where this is going: Backpack meals have none of these. And finally the most important reason MRE’s are better than backpacking meals: the Flameless Ration Heater. If it’s driving rain, freezing, and you have no fire supplies, with an MRE you can still have a hot meal. Just tear open the heater pouch, add water, add entree, and wait. Most of the pictures and a lof of good information for this came from MREinfo.com. They know everything there is to know about MRE’s and can definitely answer any questions you might ever have about things like dating, menus, and knock off brands. (They even have a message board devoted to MRE’s).